For this months Secret Recipe Club, I was assigned a fun site called Newlyweds-blog. The owner of this blog is Sweet Pea. What a fun name!!! She is a young wife and mother of identical twin boys and started her blog as a newlywed in 2006 to document her messes and successes in her kitchen. I liked her from the moment I met her on her site. She has some fantastic looking recipes and about a gazillion to chose from. 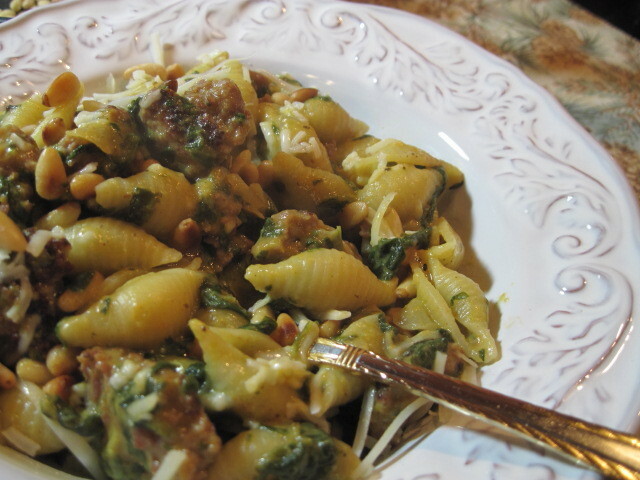 After scouring her site, I settled on her recipe for Pumpkin And Sausage Penne. Click here to check out Sweet Pea’s original recipe. When I’m faced with a decision of savory or sweet, I almost always go for the savory (especially when pasta is involved). I made a few slight changes to the original recipe but stuck to it fairly closely. Here is my completed recipe and the steps involved if you’d like to make this yourself. I highly recommend doing so. It was a hit at my house even though my husband wasn’t very anxious for dinner that day. After his first bite, he was eager to lick his plate clean! Woo Hoo! -In a large skillet over medium high heat, brown the Italian sausage well to get a deep, dark color on it. 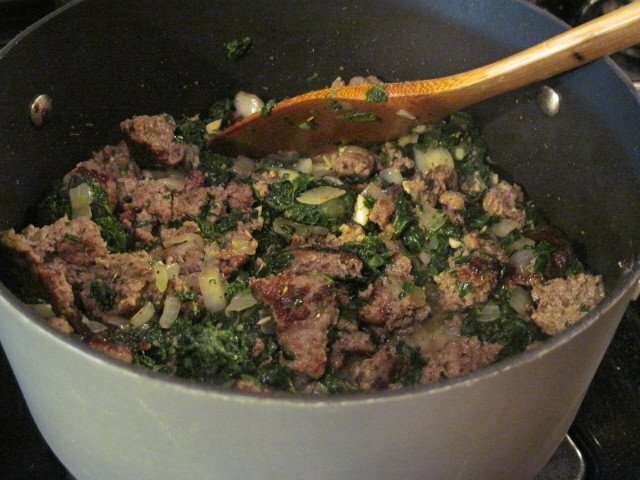 -Add the chopped onion and garlic to the sausage and saute an additional 3-5 minutes to soften. 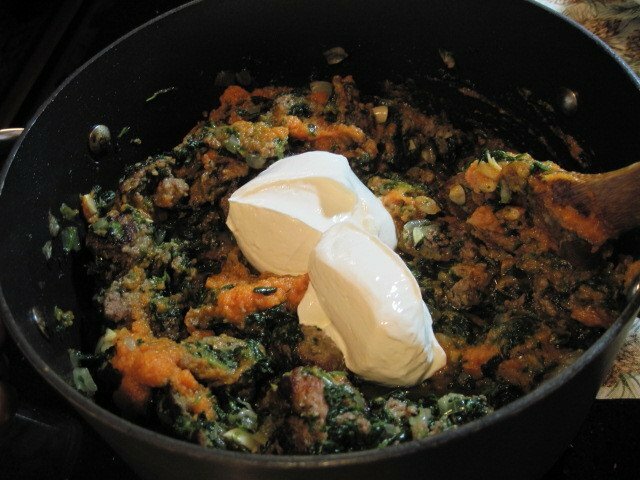 -Add the canned pumpkin, spinach, chicken broth, cream cheese and Parmesan cheese. Stir well to combine. 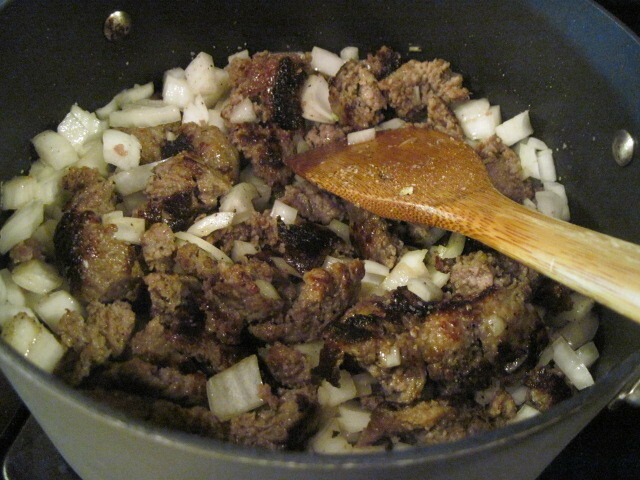 -Add the nutmeg, sage, thyme, salt and pepper. -Reduce the heat to low and simmer slowly, stirring occasionally. -Meanwhile, cook your pasta 2 minutes shy of package directions and drain when completed. 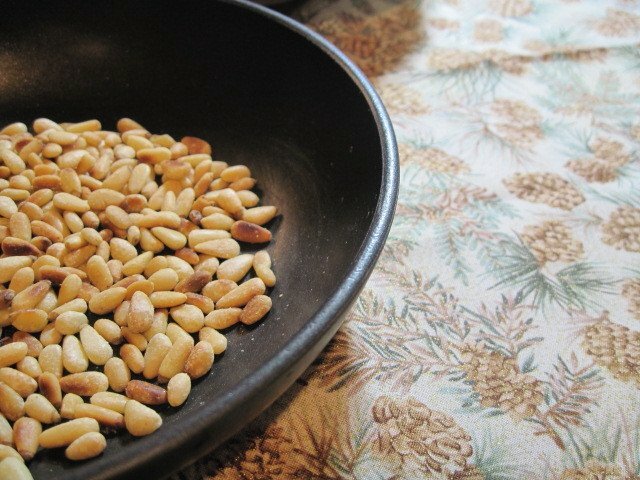 -In a small dry skillet over a medium heat, carefully toast the pine nuts stirring often being careful not to burn. 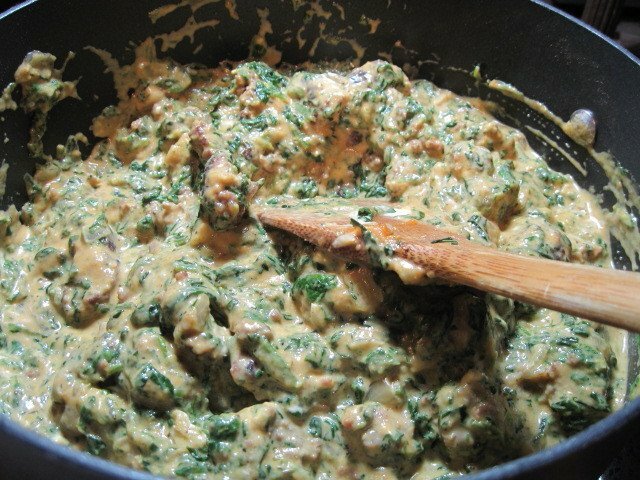 -Add the drained pasta to the sausage and spinach mixture to stir well to combine all the ingredients. -Continue to simmer slowly an additional few minutes before plating. -Right before serving, add the toasted pine nuts and stir. 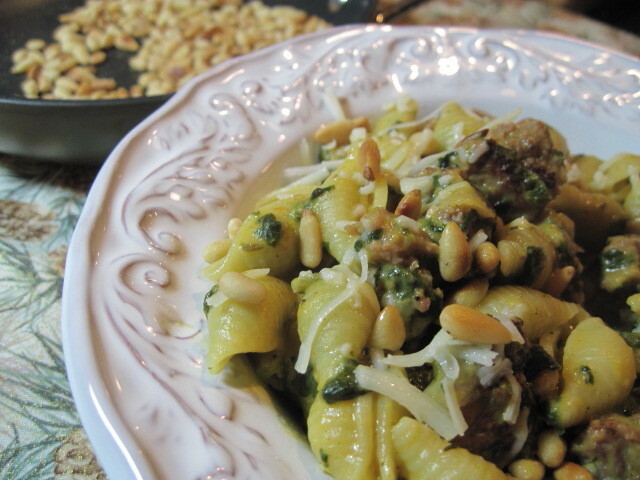 -To serve, garnish with an additional sprinkling of Parmesan cheese and pine nuts. YUM!!! I hope you like my take on Sweet Pea’s original seasonal pasta dish. This is certainly one I’ll be making again except this time my husband will actually be looking forward to it! LOL. Thanks for the inspiration Sweet Pea! Hmmm, wonder where next month’s Secret Recipe Club will take us or want to join in on the fun? You’ll find some really great blogs with some amazing recipes and it’s a great way to meet people with a passion for great food and a shared love of cooking and baking. Join us won’t you? Looks delicious I am so glad you had my blog this month. I love the changes in spices and also the addition of the pine nuts. What's funny is my hubby is the same way when I make that pasta, not to eager for it, but then always gets seconds, lol! Coming to you through SRC – this looks great! I have a can of pumpkin in the pantry I need to use. I had to laugh at the way you said that your hubby reacted. Mine would've done the same thing. lol! I'm not sure that I would've tried a recipe like this without seeing pictures of it. Thank you for the step-by-step pics! They're amazing! The recipe sounds like it's Thanksgiving in a bowl. MMM! WOW! This dish looks amazing, and I would love to try it! If only my husband would eat pumpkin! What a perfectly beautiful fall pasta dish! I LOVE pumpkin in anything–sweet or savory. This pasta dish looks amazing. Wow! This looks major YUM!!! Hi! Popped over from my SRC blog hop. This looks heart warming and delicious, perfect for the current weather. A of all: I NEED that dish! B of all: pumpkin, pine nuts, and pasta??? I am a pasta addict!! I made one like this not too long ago – so good, right?! 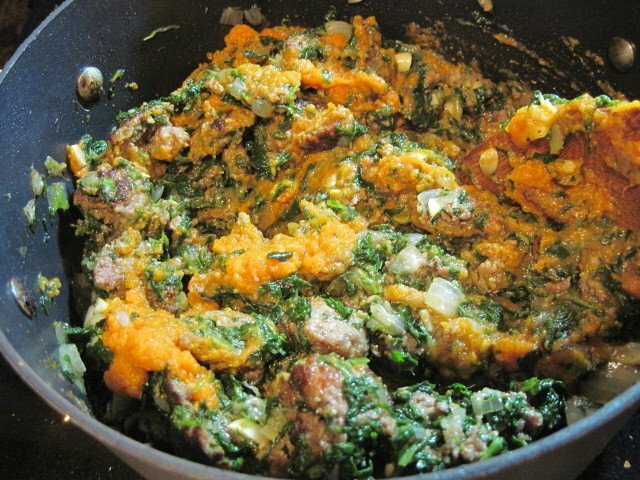 That not only looks delicious but is also so healthy with all the spinach and pumpkin. Best of all it's a one pot dish, something I would love to serve for dinner. 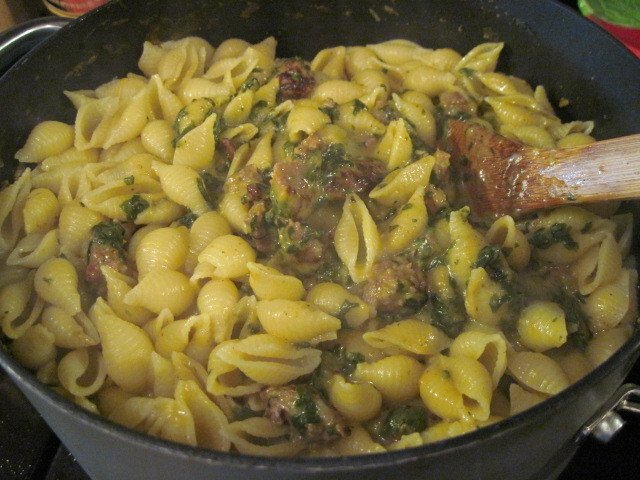 Besides it has all my favorite ingredients like pumpkin, spinach, italian sausage, cream cheese and pasta. Just found your blog through our Group D SRC blog hop and love your recipe choice for this month. I've actually never had pumpkin in a pasta dish before but this one makes me want to give it a try. Sounds delicious! Oh. My. YUMMINESS!!! What a lovely pasta dish you have here…simply delicious….and yes, I am totally salavating on this end of the computer! So fun to be part of Group D with you in the SRC! Wishing you many happy moments in your kitchen! Pumpkins & sausages, now that is a combination I have not heard of before. It looks mouth watering delicious. SRC really gives us amazing choices. I'm pretty sure I would have been like your husband when you were preparing this dish…a little hesitant about pumpkin puree being included in a pasta dish. Once seeing the finished result however, I would have been a convert just like him. Looks wonderful Renee. this looks great. I love pasta with a pumpkin sauce. I love pine nuts too!